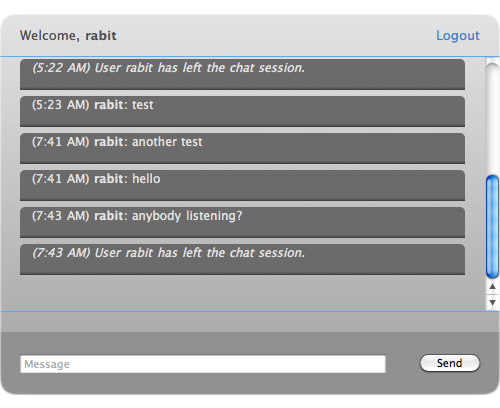 This tutorial shows you how to build dynamic web pages with revIgniter on the basis of a simple chat application. and the Chat page with a list of messages and an input field. a controller named "chat.lc", the file, that will be associated with the URI. four views, respectively page fragments, named "chatheader.lc", "chatcontent.lc", "chatfooter.lc" and "chatlist.lc". Of course two view files, one representing the Login page and one representing the Chat page, would do, but this is to demonstrate how multiple views are assembled and as a side-effect we avoid redundant html code. a model named "chatmodel.lc", the file, which deals with information in your database. a table in your database named "chat" to store the chat messages. We use MySQL here as the database platform. If you have not read about controllers, views and models in the User Guide you should do so before continuing. Note: Before we begin save the following stylesheet in assets/css/chat.css and build the table using the table structure below. The controller consists of two handlers commonly used in controllers and three additional ones. The first handler chat is named after the file itself and is called before any other handler. It loads all required libraries and helpers plus models and the database if needed. The second handler, named index, is the default handler, which is mandatory. This handler is called automatically if no other handler is specified in the URI. Further we need a handler, which adds new messages to the database, a handler, which gets all the messages and displays them, and finally a logout handler, which ends the chat, destroys the session data and reopens the login page. Save this script as "chat.lc" in application/controllers. This controller is associated with an URI like this: example.com/index.lc/chat/ or, if you use a .htaccess file with appropriate mod_rewrite rules: example.com/chat/ (see revIgniter URLs). The controller handler chat is called first. So, this is a good place to load required libraries, helpers, models and the database. Note: Mind the version number of jQuery. The jQuery library is not compatible with newer versions of jQuery. Actually it is tested against version 1.4.2 but this sample application works with version 1.7.2 too. If there is an item "name" in the session data we save the name in the global variable gData and set a flag to skip the Login page and to load the Chat page instead. If the item "name" is missing in the session data we check if the user sent a name via the login form. This is done with the help of the rigVarPost function. If the POST data contains a value for "name" we save it in the session data as well as in the global variable gData and set a flag to load the Chat page, otherwise we set a flag to load the Login page. rigJQset "'#userinput'", "attr", "'value', ''"
Note: If you use jQuery version < 1.6 replace the jQuery prop methods with the jQuery attr method. The last statement gets the messages list from the database with the help of the getMsgData function. This function needs to be implemented in the model later. You may notice that the name of the model handler _addMsg has an underscore as the name prefix. This is to hide certain handlers from public access. These handlers will not be served via a URL request. Note: Don't forget to add the handler name "addmsg" to the global variable gControllerHandlers at the top of the page. Of course, later we need to make sure that the model contains a getMsgData function. Note: Add the handler name "view" to the global variable gControllerHandlers at the top of the page. Note: Add the handler name "logout" to the global variable gControllerHandlers. The model is responsible for database related tasks. In this case our model serves two purposes: It gets messages from the database and it stores new messages in the database. As described above, the controller calls a model function named getMsgData and a model handler named _addMsg. We will now build a model consisting of these two handlers. As specified in the chat handler of the controller script, name this file "chatmodel.livecodescript" and save it in application/models. First we set an ORDER BY clause, which orders the query result ascending by a column named "id". As this column is auto-incrementing this means that new messages will be located at the bottom and old messages at the top of the list. Then we retrieve the data from the database and store the result, an array, in a variable. Note: The table row data is stored in an array where the keys are the table field names.This array can be accessed with the help of the rigDbRow function. This handler is called by the controller. It puts a new message along with the user name and the current time into an array and inserts this data into the "chat" table. Now, that's all about the model script and all that is left to do is to build the view files. Remember: We stored the page title earlier, when we built the controller, in the global variable gData. Here, we call a Jquery library function, which returns a html string linking to jQuery. This is an asset helper function, which generates a CSS asset location html code. Note: Don't forget to replace the action attribute with the proper URL. Here we display the name of the user, which we stored in our global variable gData. Further there is a link, which is used by the jQuery script to end the chat session. This unordered list is built dynamically when the page is loaded the first time or whenever the message data is updated by the jQuery script, which loads the chatlist view to replace the data in this list with new data. You may replace the action attribute with the proper URL, if you like, but it is not necessary because the jQuery script prevents the default action anyway. So, this attribute could even be empty. The URI is correct though. It specifies a controller named "chat" and a handler named "addMsg". Check out the jQuery script, and you will notice, that it uses this URI to post new messages. As mentioned earlier, the jQuery script contains a function, which loads the messages list. This is done by sending a request to chat/view. Then the view handler puts the messages list into the gData variable and loads the chatlist view, which is used by the Ajax request to replace the HTML code inside the div with the id "chatbody". That's it, your chat application should work as expected. revIgniter's approach to separate application logic from presentation permits your web pages to contain minimal scripting since the presentation is separate from the LiveCode scripting. By using revIgniter you don,t have to write a whole lot of rev code as you don't have to write libraries from scratch. revIgniter provides you with all the features you need (almost). So, you can get right to work and accomplish a lot in the least amount of time.